Business Address : 1613 Texoma Park Rd. 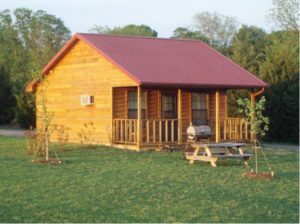 Cabin Fever Adventures has authentic cabins designed for the sportsman and his wife and children. We are just minutes from Lake Texoma in the Alberta Creek area. Cabins interiors are very clean with knotty pine walls. All cabins are outfitted with a flat screen T.V. with cable, including the outdoor channel. And for those who have to be connected to the internet we have wi-fi to each cabin. On the property we have a small pond stocked with catfish for the kids and free cane poles for them to use. Every cabin comes with their own barbecue and fire pit to enjoy an evening campfire. There is plenty of boat parking for the people who are going to fish in the area. You catch’em and we have an excellent covered fish cleaning area with lights, stainless tables, and running water. And as a treat there is lots of wildlife in the area such as deer and turkey. Guide services also available.